LG 2019 TVs: 8K, 4K, OLED, LCD – everything you need to know | What Hi-Fi? 8K, rollable 4K, OLED and LCD – LG is ticking all the TV boxes in 2019. So, we've come up with a useful guide to the key models we can expect to see over the next 12 months. It’s still a bit early to say which are the best LG TVs in 2019 and which should definitely go down on your shortlist, but we've laid out all the sizes, features and tech highlights for you to absorb. You’ll find all this information below, including recently announced prices and release dates. LG 2019 TVs: What's new? 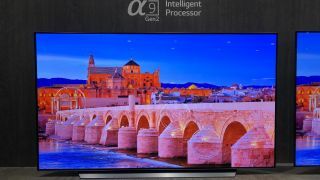 LG's premium 2019 TVs are powered by the company's new Alpha 9 Gen 2 processing engine. It features across all five OLED ranges and also powers LG's 75in SM99 8K LCD TV. This latest Alpha 9 chip combines with LG's two-pronged approach to tackling picture and sound quality on its 2019 TVs. AI Picture uses a Deep Learning algorithm which optimises the picture by consulting a look-up table of content and comparing it to the incoming signal. The TV then adjusts the image automatically to deliver what it believes is the most accurate picture. It's a system similar to one already used by some rival TV manufacturers, including Panasonic and Sony. LG claims it should result in a cleaner, sharper picture than its 2019 sets, with less banding. The technology also uses an advanced ambient light sensor which can adjust the TV’s tone mapping curve based on your lighting conditions. The tech works on two levels depending on the content being shown. With SDR content it adjusts the overall panel brightness, but with HDR content it can adjust the picture to an ever finer degree. LG's AI Sound technology introduces more advanced audio processing to LG's 2019 TVs. It gives compatible sets the ability to upmix a stereo signal into virtual 5.1 surround sound. AI Sound Tuning (carried over from 2018) allows LG's sets can also take into account the specifics of your room layout and acoustics, and tweak the sound accordingly. As was the case with LG's 2018 premium OLED and LCD models, Dolby Atmos (and Dolby Vision) support is included. The arrival of HDMI 2.1 inputs on LG's 2019 TVs means support for 4K resolution and high frame rates (HFR) up to 120 frames per second is now included. The sockets also bring with them eARC support and they're also compatible with variable refresh rate (VRR). LG is also promising a big decrease in game lag for its 2019 OLED TVs, with a claimed figure of 12.9 milliseconds (down from 21ms). Select LG TVs, including its entire OLED range and premium NanoCell LCD models will have Apple AirPlay 2 and HomeKit support. Similar to Samsung, these TVs will will also support the Apple TV app, which will mean you'll able to enjoy Apple’s 4K HDR content (including Dolby Vision and Atmos) through compatible sets. For 2019, LG's smart TV system is getting a boost in power. Google Assistant support is built-in at launch, while Amazon Alexa will arrive via a mid-year update. LG is promising more contextual conversations compared to its 2018 models. Press the dedicated mic button to interact with ThinQ AI and the TV decides whether it can carry out the command or if it’s one for the Google Assistant. To use Alexa, press the dedicated Alexa button on the remote. On the audio side, all of LG's OLED and flagship LCD sets are WiSA (Wireless Speaker and Audio) Ready. The technology allows for wireless streaming of up to eight channels of uncompressed 24-bit audio and also includes support for formats such as Dolby Atmos and DTS:X. At CES 2019, LG officially announced five new ranges of OLED TV – Z9, R9, W9, E9 and C9 – with screen sizes ranging from 55in to 88in. The big news is that we can expect to see both 8K OLED (Z9) and 4K rollable OLED TVs (R9) go on sale this year. Z9 and R9 are due to land in the latter half of the year, with the R9 going on sale in Korea first. The former will be available in a mammoth 88in screen size and the latter as a 65in set. The OLED88Z9 comes with its own stand which carries all the connections and a built-in soundbar. It can also be wall-mounted. Meanwhile, LG's physics-defying OLED65R9 rolls up into its own TV stand which doubles as a wireless speaker. 2018's 'G' range has been jettisoned, presumably to make way for the rollable and 8K sets, while E9 continues LG's 'picture on glass' design, with slight refinements to the amount of glass on display and the speaker configuration used (the E9 loses its middle 'foot'). The C9 range gets a refreshed 'Alpine' stand for 2019 which doesn't protrude as much as previous iterations. LG hinted at CES that an additional entry-level B9 range could be on the cards, and it has now appeared on LG's US website in 55in and 65in sizes. Like 2018's B8 models, they are powered by a different processor to their siblings. The B9 uses LG's Alpha 7 Gen 2, rather than the Alpha 9 which is slightly less powerful and uses a smaller look-up table. LG has dropped the Super UHD label from its 4K NanoCell TVs in 2019 and widened its Nano umbrella to also include specific technology and design elements. NanoAccuracy and NanoColour relates to the advanced picture processing onboard these new models, while NanoBezel nods at the new ultra-thin bezel. All LG's premium LCD sets boast a full array backlight with local dimming and HDMI 2.1 connectivity. There's also Dolby Vision, Atmos and AirPlay 2 built in. It's only the 8K SM99 that gets the Alpha 9 2nd Gen processor - the other models in the range use LG's second generation Alpha 7 chip.